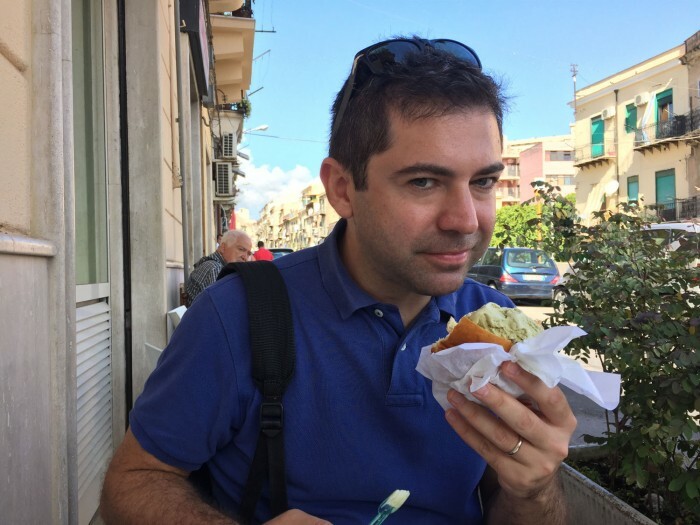 I went to Palermo for five days with few expectations. I hadn’t had much time to read up on the Sicilian city: spurred by an urge to eat some good fresh fish, my husband had booked cheap flights on a whim. 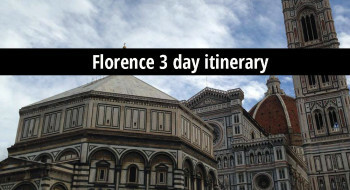 The direct flight from Florence to Palermo with Vueling took less time than my bus to work; from there, a bus took us into the bustling center of this city of over a million inhabitants that was to be home for a few days. A huge Airbnb apartment, rented for a song, welcomed us. 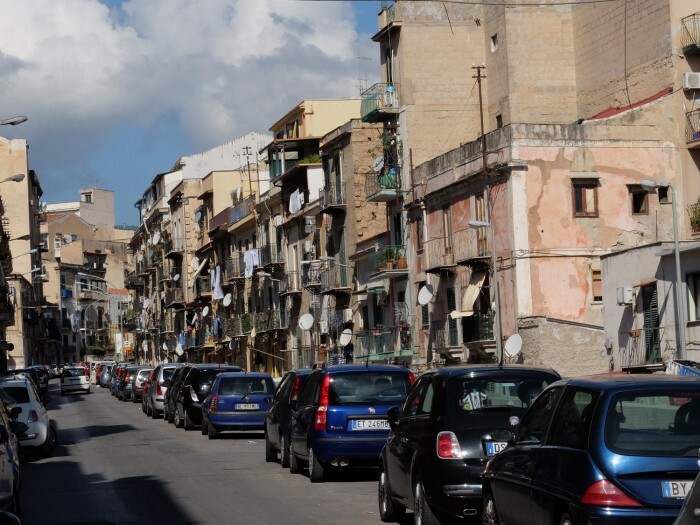 In the days that followed, we discovered Palermo mostly on foot, and guess what? We loved it. There are lots of things to do in Palermo, a city that offers a gateway to the East, a taste of the exotic while still in Italy. We tried to experience as much as possible, taking in its art and architecture, food and culture. After a short introduction to the city to help you get oriented, I’ve listed 27 things to do that I hope you’ll enjoy as much as I did. The strategically located port town was settled in the 8th century BCE by the Phoenicians, and was subsequently ruled by just about everyone with power, from the Ostrogoths to the Byzantines to the Holy Roman Empire. The strong presence of the Byzantine Empire in the 11th century left its artistic mark on the city, a heritage that today we can appreciate as distinctly “Eastern”. In the Renaissance it was a dominion of the Kingdom of Spain, and after that, in the early 18th century, it passed hands through the Savoy and Bourbon dynasties, joining the Kingdom of Italy in 1861. The take-away from all this? Like Naples, Palermo was not a self-ruled republic or dynasty, but was always at the hands of a dominating power, who brought foreign influences and money – but just as easily, took them away. When in doubt, ask a Professor! This is Stefano. 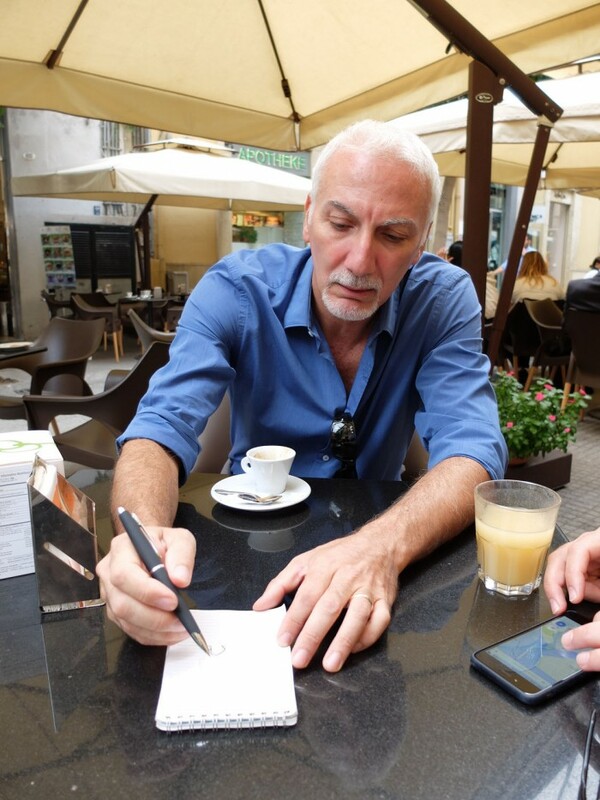 On my first day in Palermo I met up with a professor of architecture, Stefano Piazza, to get a bit more background. His interpretation of the history of the city through its physical plan really helped me appreciate it better. At risk of major simplification, the following information makes it easy to understand how the city is laid out. 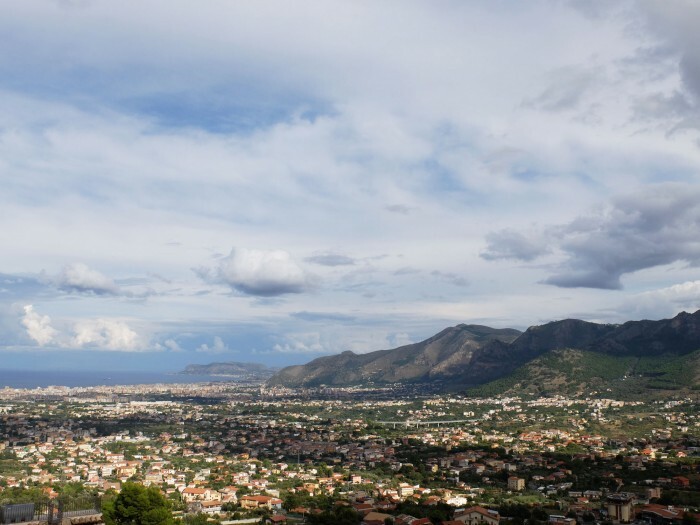 While it grew organically in the middle ages, now Palermo is dominated by two clear axes. They meet at the “Quattro Canti”, a Baroque piazza marked by fountains that has just recently been made pedestrian-only. 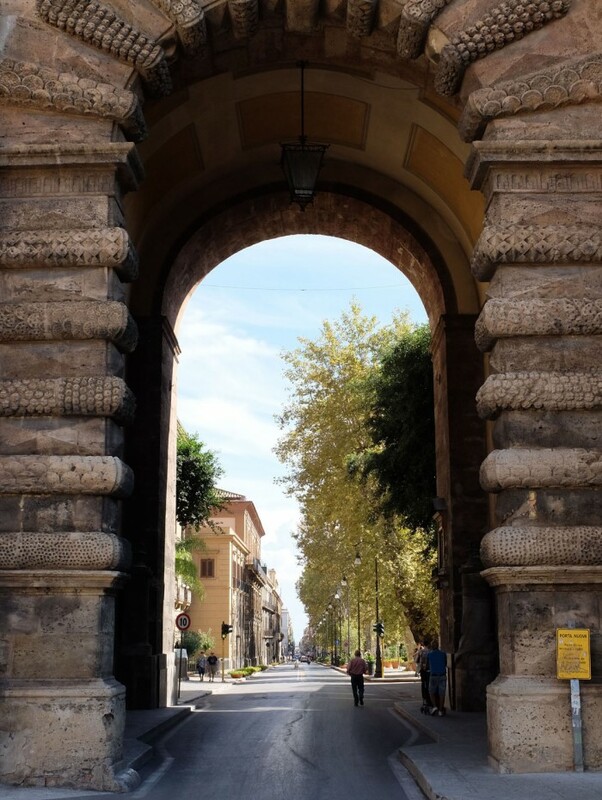 Via Vittorio Emanuele (previously Via Toledo or il Càssaro), built 1567-1582, leads from Porta Nuova, near the Norman Palace, straight down to the sea at Porta Felice. The cross street is via Maqueda and dates to 1596-1620. The reason for the widening and lengthening of these two streets was to create a clear division of four zones of the city, permitting the military to easily march down an axis and isolate any zone that was causing trouble. This major urban planning decision also created areas (four “mandamenti”) whose characteristics are still clear today, i.e. some more poor, others more clearly wealthy. Porta Nuova – you can see the ocean on the other side if you look real hard! In the 17th and 18th centuries, Palermo had a population of around 200,000, which grew to almost 700,000 on the eve of WWII. The city had expanded well beyond the historical center. Then, in 1943, it was heavily bombed, one of the worst in Italy. While some continued to live in this city that had already been left to its own devices for some years, others abandoned it completely, for the dangerous suburbs or for the mainland. If you get off the main axes and down into the markets and back streets of Palermo, you’ll still see plenty of boarded up buildings and still more that are literally bombed out. 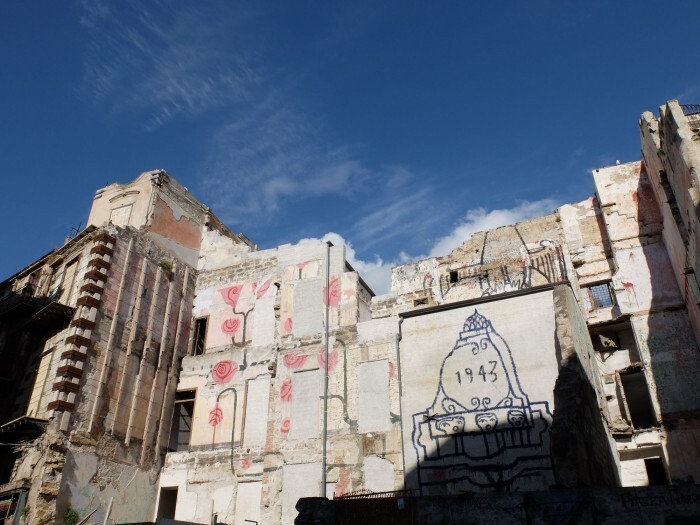 One piazza, with a Renaissance fountain at its center, features a bombed out building with graffiti citing the year 1943. These places have been left as memories. After a period of even worse decline in the 1980s, when the government was literally under control of the local mafia, a new city administration under Mayor Orlando saw some hope in new urban planning, job creation and more. Unfortunately he was interrupted by another governmental interlude that managed to send the city into bankruptcy, and it is just now finding some funds to pick up garbage and fill gigantic potholes. As a tourist, the city center is perfectly safe and rather clean, and public transportation works surprisingly well. The residents we spoke with were still somewhat pessimistic – it’s a city poised for change, but that offers little opportunity for youth, even those who wish to work hard. This framework – which is my interpretation of what Stefano told me – helped me understand what and why I was seeing. I hope it helps you too. From an artistic point of view, Palermo’s prime style is Baroque, but it is a very different Baroque than the dark, heavy early Baroque in Rome. 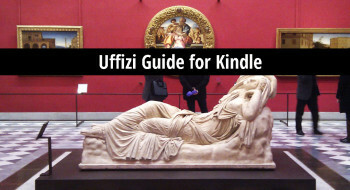 It’s closer to the Baroque in Naples – light filled, with lots of pink marble, pattern and drama. I absolutely loved the right marble Cosmateque and, later, inlay works. 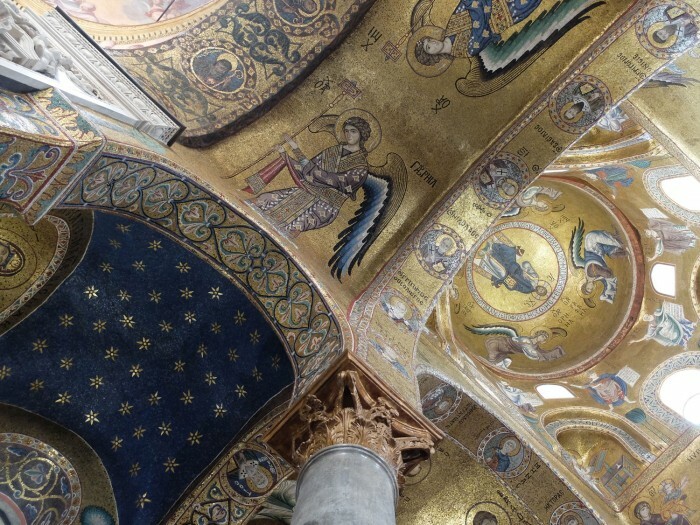 The other tradition you’ll see is that of mosaics, due to a strong Byzantine influence. Both media provide a joyous contrast to Florence’s comparatively staid frescoes and I was really happy to just sit in these churches and drink it all in. Stefano took us to this church as he said it was his favourite of the “endemic Baroque style” which is a nice way to say “typically Palermitano”. It’s a great example of how this city uses lots of marble inlay and illusionistic paint in their decoration. The church is nestled into one of the four “corners” at the Quattro Canti and it has a beautiful, quite staid, marble facade. It was begin in 1612 but consecrated only in 1677; the pavement and ceiling are accurate reconstructions of the 17th-century ones after the church was heavily bombed in 1943. 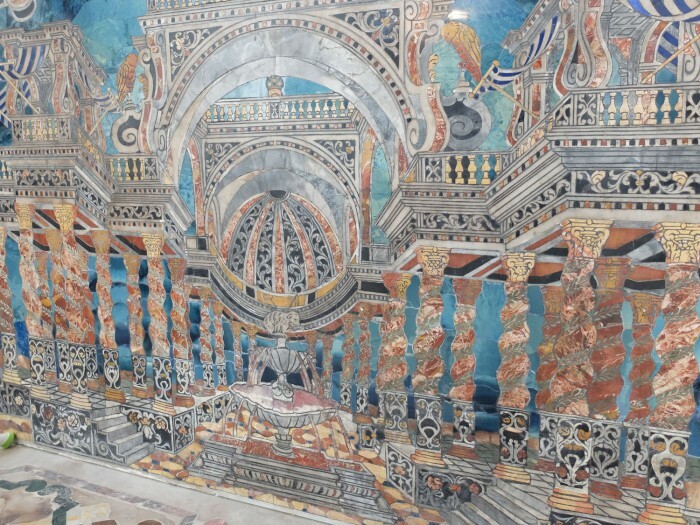 This first awesome dose of mosaics in Palermo hit me as a total surprise – that’s what happens when you don’t use a guidebook! This eastern Orthodox church, now used by the Italo-Albanian community, is a small Greek cross with fantastic 12th-c gold mosaic work on the interiors of its domes. The cosmatesque (early marble inlay) work of the floor and altar is also not shabby! 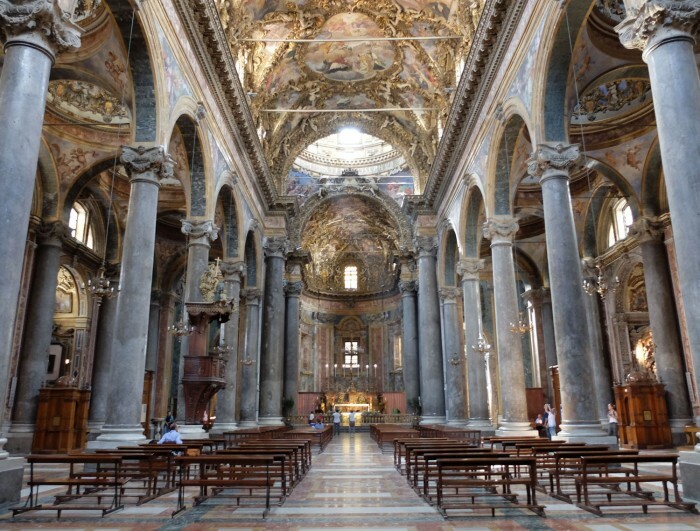 The original nucleus of the church was later expanded for Western liturgy, though was restored to the Greek orthodox liturgy by Mussolini. 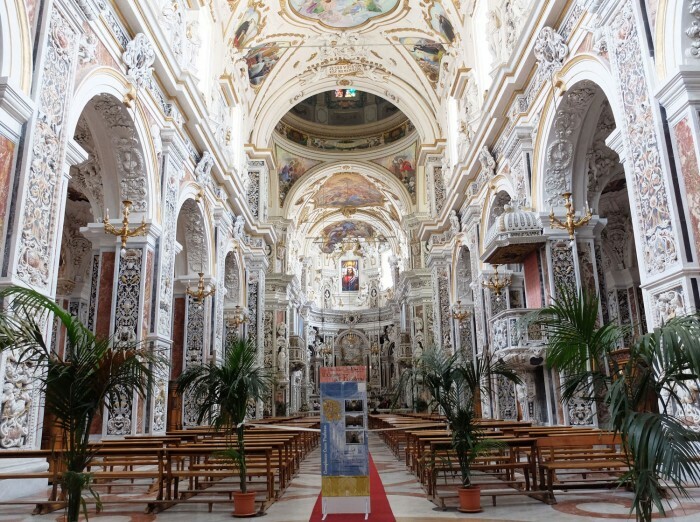 The Gesuit order’s church in Palermo did not lack funding, as you can see by its huge size and extremely elaborate marble decoration. You’d think some of it were painted “trompe-l’oeuil” but no, it’s real! The marble decoration, which is not the same in any two areas, was begun in 1658 and took a few decades to complete. The painted decoration of the ceiling was done in the 18th century, and then was bombed in WWII. The current ceiling features a modern work of art, and some of the marbles were also re-done at that time in imitation of the previous decoration. 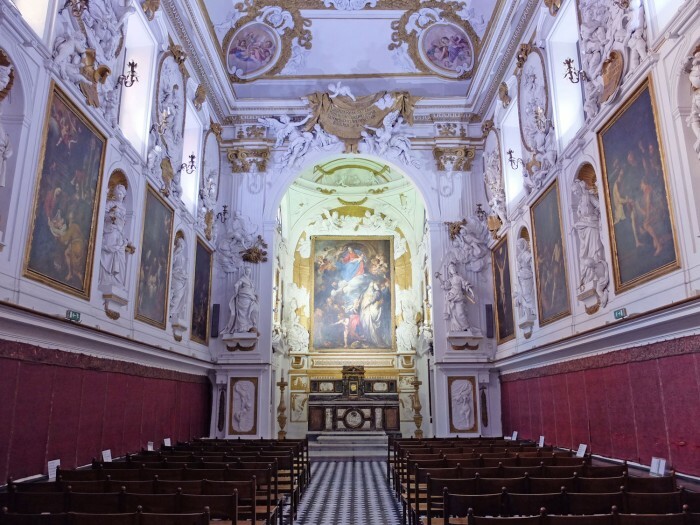 Make sure to head behind the apse where there are some complex iconographies represented in marble intarsia, based on designs by Giacomo Serpotta, the city’s favourite 17th-century sculptor. Opening hours: Daily 6:30am to 1pm and 4-7pm. Sunday 6:30 to 12:30 and17-18:30 but not necessarily (it didn’t reopen in the afternoon when I tried to go there on a Sunday). Photos were not permitted so I could only snap this one for you. Tucked in to the Capo market area, this church is devoted to the Madonna of the Immaculate Conception and is the focus of a lot of popular devotion. I particularly enjoy the light-coloured marble inlay work here, which I think seems particularly feminine. Don’t miss the altar fronts, each designed with illusionistic scenes or narratives, with a predominance of turquoise, which actually is not marble but made of paste (just for that colour). Not in Palermo proper but in the outlying area of Monreale, put this UNESCO Heritage Monument on your must-see list because it is entirely covered in mosaics. 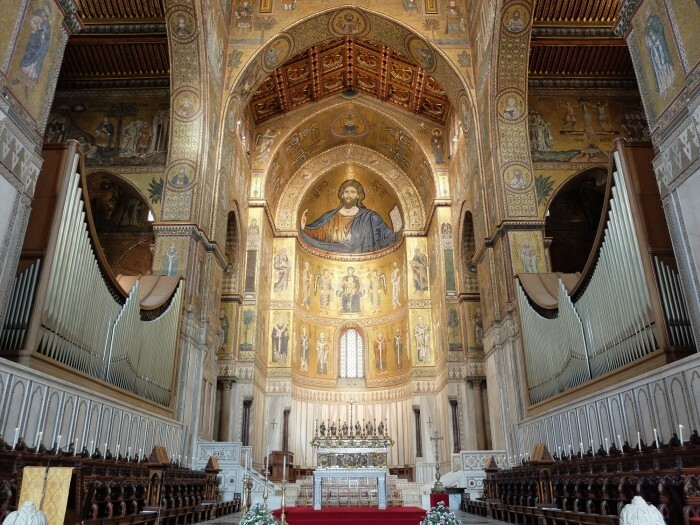 Not just the apse – with a most enigmatic, gigantic Byzantine Christ – but the whole nave, all the columns, everything. And the floor impressively done in inlaid marble. But I’ve gotten ahead of myself. The Cathedral of Monreale was constructed in the 12th century by the will of King William II of Sicily, in a show of artistic rivalry with Palermo. The building took only 10 years, though of course the mosaics took longer. To give you a sense of size, the basilica is 102 meters long and 40 meters wide, and there are 6340 square meters of mosaics, which is an insane amount. I don’t have space to tell you much more, but I recommend purchasing a small book or looking up a diagram of the narrative elements of the church so you can go in and “read” the walls. We hired a not-entirely-legal private driver to drive like a maniac to get there, but there are bus tours, legal taxis and other methods of transportation available. 2 hours is a good amount of time to see the church and enter into one of your choice of 3 different paid areas. We chose to walk up on the exterior wall of the church, down narrow corridors and on thin external ledges that surely betray safety codes, climbing up to the very pinnacles of the architecture, overlooking the entire bay of Palermo. For the opening hours, see here – watch out, it’s closed at lunchtime! I admit, I didn’t visit any museums while in Palermo, and that’s too bad, as the city has a few that I’d really have enjoyed seeing. However, the contemporary museum (not listed here) was closed between exhibits, and the others had impossible to reconcile opening hours (ie. closed weekend afternoons and Mondays, hardly ideal if you’re visiting for a long weekend and want to get in a market in the morning…). I’m sorry to have missed this museum and recommend that you be better organized than I – I left my visit too late in the weekend to see it. 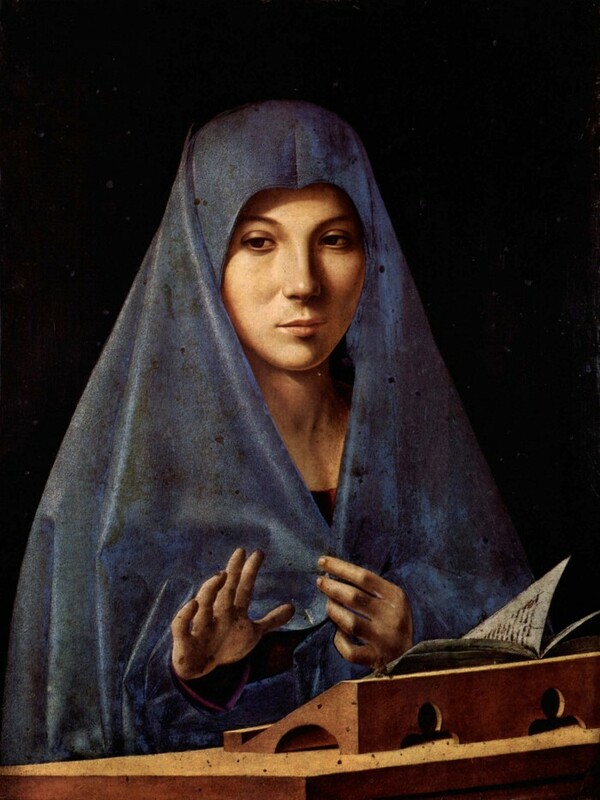 Mainly for its star painting, the Madonna Annunciate by Antonello da Messina, which I think may be one of the most arresting paintings of the Renaissance. I have no doubt that the 15th-century palace, which has been almost entirely rebuilt due to bombing, contains a fascinating collection of painting and sculpture. Opening hours: Monday to Friday, 9-19. Saturday and maybe Sunday, 9-13:30 (conflicting information from the Region’s website), closed Monday, maybe closed Sunday. 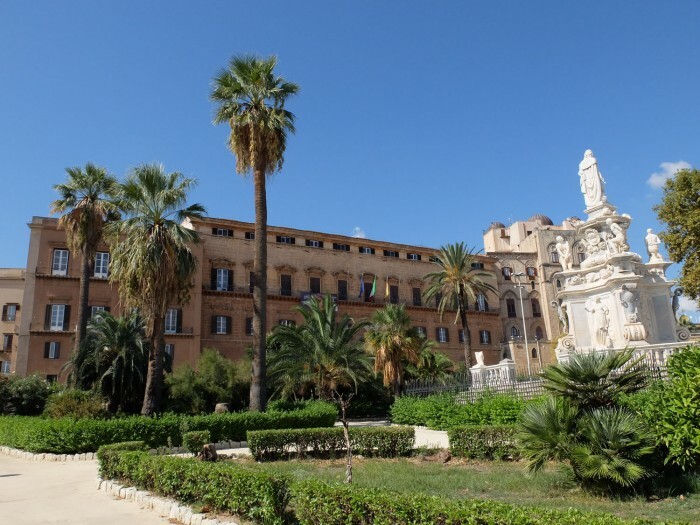 Palermo has a number of noble palazzi or private homes, but this is one of the few that you can visit inside. Palazzo Mirto was donated to the Region of Sicily in 1982 by donna Maria Concetta Lanza Filangeri, the last heir of one of the most important noble families on the island. The interior decoration is just as she left it, which mostly reflects a late 18th century arrangement. Opening hours: Tuesday to Saturday, 9-18. Closed Sunday and Monday. The Norman Palace is probably the city’s top tourist attraction, which is why, although we walked all the way there, we didn’t go in. The building was the seat of the Arabic and then Norman rulers of Sicily, and is still the Regional governmental seat, with interesting remainders of different moments of history apparent in its rooms. But in a town with so much to see without crowds, the line was just too long for me. If you haven’t managed to see any other mosaics, you’ll probably want to go in here as there’s an important 12th-c Palatine Chapel with mosaics inside, but to be honest, I figured I’d had my share at the spectacular Monreale, and decided to use my time more efficiently by eating granita (see below). A strong culture of confraternities grew up in 16th- and 17th-century Palermo, groups of lay persons who united to perform either religious or social functions. The oratories they commissioned doubled as places of prayer and of meeting. The artist most loved by these groups was Giacomo Serpotta, a 17th-century sculptor who created emotional figures in white gesso, which of course was appreciated because it cost much less, and was faster to make, than marble. One of the three major oratories of the city, I particularly like San Domenico for its interesting combination of painting and sculpture. 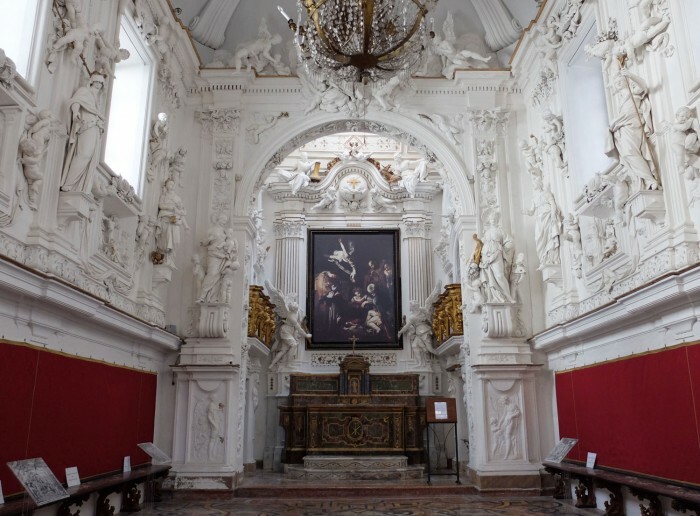 On the main altar is a painting by Anthony Van Dyck of the Madonna of the Rosary, made when the painter from Antwerp was in Palermo in 1625, and he used bright colours and zealous emotion that appealed to his Sicilian clients and adapted to the local Baroque style. This has been integrated into the gesso decoration by Serpotta, which has angels reacting to the painting. 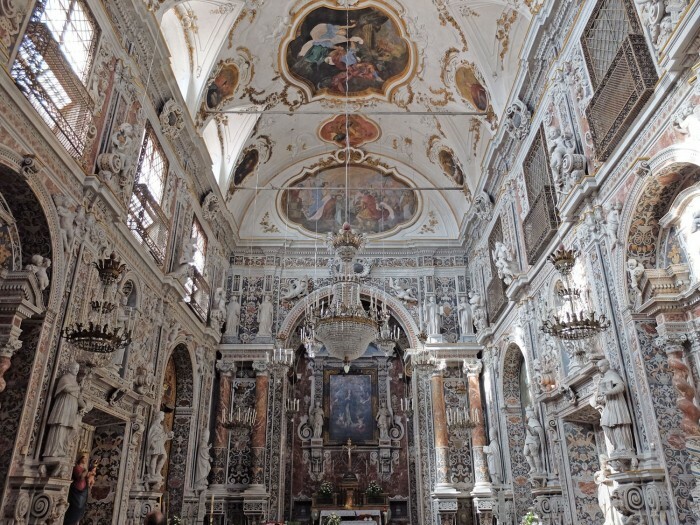 The side walls have sculptures representing virtues, alternating with other local Baroque paintings. There’s a great audioguide available, and when we visited, we had the place to ourselves! Santa Cita, Serpotta – detail of putti. The other major work by Serpotta after San Domenico is Santa Cita, and it’s considered his masterpiece. If you take a look at this detail of putti you can see that he really went all out. For more historic information and the source of the above photo please see here. Photos weren’t permitted here, but how else could I show you the Oratory of San Lorenzo? A later work by Serpotta, he used a series of dioramas to represent scenes from the lives of San Lorenzo and San Francesco. The story here is sad though, and it’s not just about the grilled martyr. Someone broke in and stole some of the figures from the dioramas – but not all of them! They’re less populated than they should be, but the main figures required for legibility have been left for the public. Similarly, the Caravaggio painting above the high altar was stolen in 1969. Both items would be impossible to sell, and are probably behind some oligarch’s secret wall. Travel is about more than checking “things to see” off your checklist, as I’m sure you’ll agree. Although I tend to be a very art-oriented traveler, sometimes I like to just “be” in a place, or eat something special. Palermo has plenty of this, too. 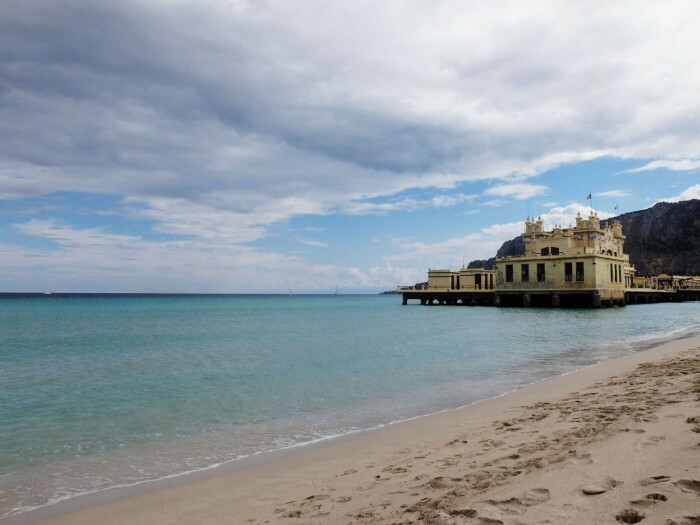 Palermo is on the water, but it doesn’t have a beach right in the city. Rather, it’s answer is Mondello, which can be reached on regular public bus in half an hour for a 1,50€ ticket. And it’s amazing. I can imagine that in the heat of summer it’s pretty crowded, but we went on a nice day in late September that wasn’t exactly warm, and we were two of a handful of intrepid tourists who went for the last dip of the season. The water is absolutely crystalline blue and oddly enough, it isn’t very salty and it smells clean on your skin! Even in the winter, on a sunny day this place will be a windy paradise. If and when you visit Mondello, go eat fresh fish at Al Gabbiano, which looks like it would be really touristy, but it’s really good and has a great view as it’s literally right over the ocean. Here’s my review on Yelp. I’m going to write more about Zeste soon, but I want to tell you about this amazing find in Palermo. 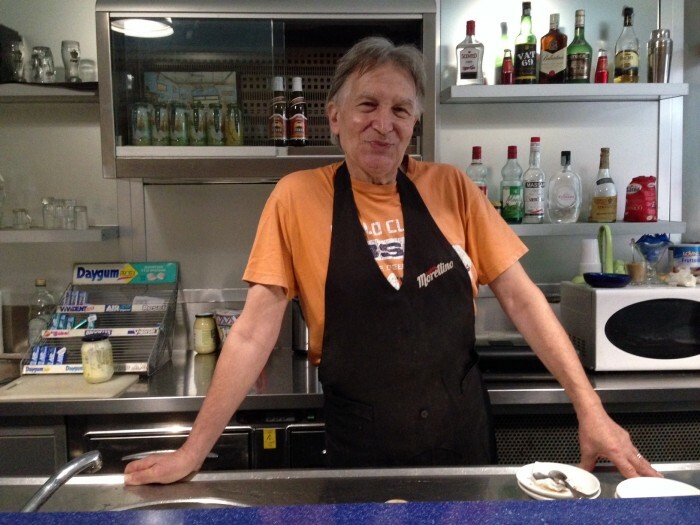 Zeste is a cooking school – slash- dinner club run by the gorgeous, hospitable and energetic Valeria Trapani. 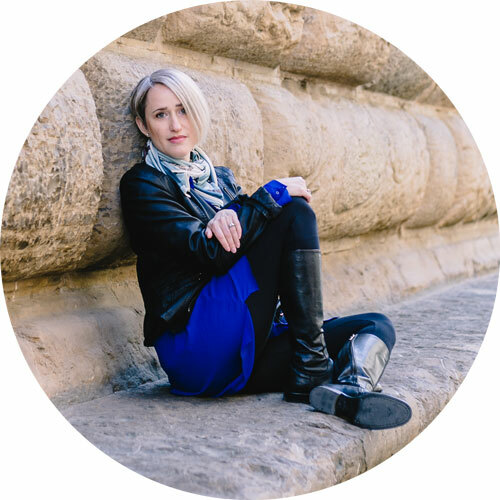 She’s a food anthropologist and her place is all about storytelling. I highly recommend the experience, I wish I’d found her on our first day, we would have spent a couple of days here. Zeste is an airy and modern space that just opened up in the Spring of 2015 in Palermo’s nicest neighbourhood. On weekdays, there are daily thematic lessons, or you can reserve whatever you want to learn, while Friday and Saturday nights she does set menu dinners. Open to members with a 25€ club card, lessons are a steal at 25-30 euros. What you come out with, more than just learning how to make a dish, is a whole concept and history of Sicilian food. And a very full stomach. We had lunch with Valeria on our last morning in Palermo and, unable to finish the caponata with fried capon fish, we brought it home in our carry-on. At security they did not bat an eyelid – food is taken seriously here. When in Sicily, you’ve got to try the real thing: granita is the origin of that thing they call a Slushy in the USA, but it has nothing to do with 7-11. Made from real fruit with just sugar added, or available in flavours like coffee and coconut, a real granita is like a refreshing almost healthy drink! 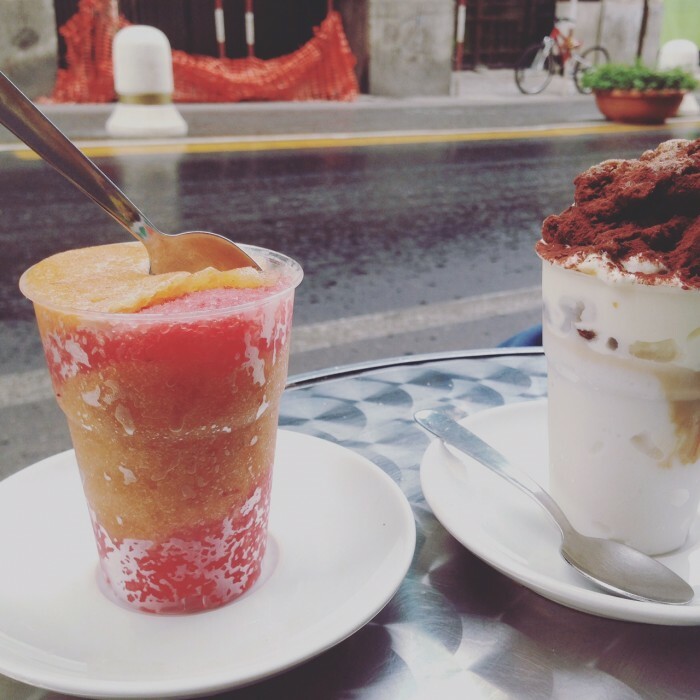 We sussed out the “best granita in Palermo” with this article in Italian, which directed us to the bar “Cafetteria del Corso” run by a gentleman named Pino. The granita isn’t exactly advertised, you have to ask for it and it’s hidden in a freezer by the door! He makes just a few flavours each day, and his fruit flavours are of course totally seasonal. He’s so excited to have tourists find him, and credits that article for bringing him a ton of business. He happily took our photo for us, and we took his, too. 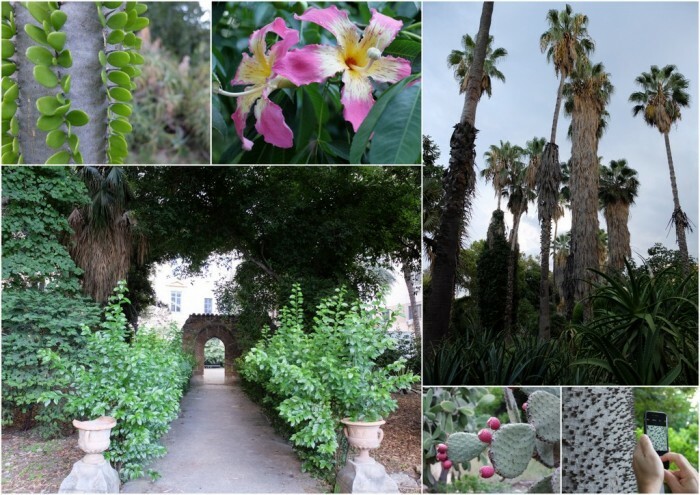 There’s a lot to see in Palermo, but if you have time, put the Botanical Gardens on your list. Not just for plant-lovers, this place has some really unusual specimens! It could use a little extra loving care, but I guess there is never enough funding for these university-run gardens. I’m not a big wearer of vintage clothing because I only like the really good stuff, and normally it costs too much! 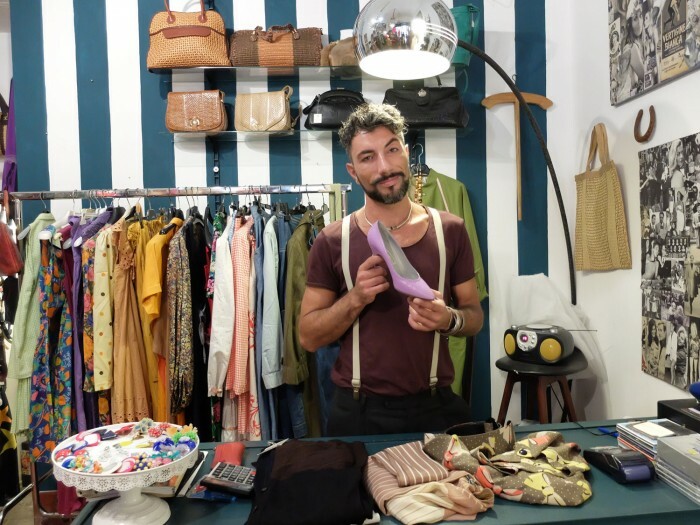 So imagine my surprise to come across some real steals at Magazzini Anita on via Maqueda, where Fabio (pictured) helped me find 2 awesome couture silk dresses and a sweater for under 200 euros. One of the main things Palermo is known for is its four major markets, so you gotta wonder how it took me so long to get around to mentioning them! 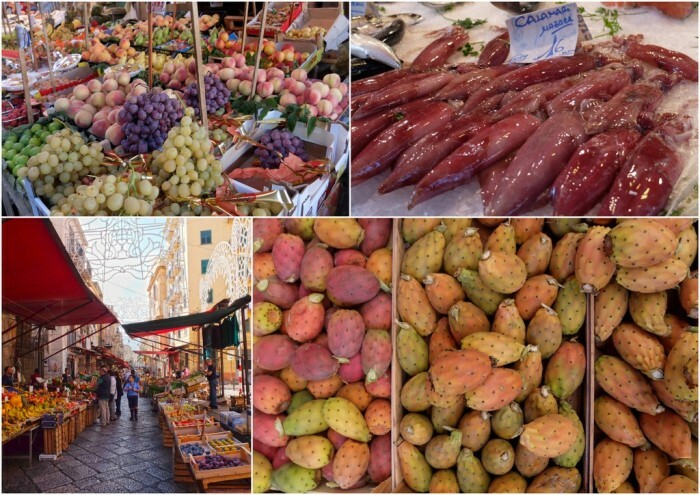 Vucciria, Capo, Ballaro and Latterini are the four historic markets, to which you might add the fun flea-market not far from the Norman Palace (this post on Swide is a nice summary of each market). We went to the Capo one day and bought some local fruits, vegetables and cheese for a healthy lunch at home. Beginners’ tip: prickly pears are thus called for a reason. They sell them with the big needles cut off, but they’re covered in fine “pricks” too! I would like to officially thank my husband for not telling me this (and then for cleaning my hands with tweezers, che amore). Handy tip anywhere you are in the word: google “special evening opening” plus the name of the city you’re in and possibly the date or month. You’ll find good stuff (if you’re lucky). I looked up “apertura straordinaria Palermo settembre” and found out that precisely that Saturday night, there was a special opening of these ballustrades along the rooftop of the Cathedral of Palermo! This was a great opportunity to see the otherwise underwhelming Duomo from another point of view, and take some photos of the city from above at night. Totally worth the €5 entrance fee! This may be the sketchiest street we found. I’m sure I don’t have to tell you to wander off your route to check out the back streets, but don’t miss Palermo’s funky medieval streets that wind out from the major crossways! Some of them can be pretty sketchy looking but in central Palermo during the day it’s perfectly safe. One interesting thing to notice is the way the typical balconies are constructed out of metal supports anchored into the wall, holding up the thinnest slabs of marble! It sure doesn’t look safe, as the marble is often no thicker than a kitchen counter. Some of the more recent ones have reinforced cement structures underneath but many are literally just placed there. Pietro Tramonte sits on his chair on what may be the world’s first guerrilla bookstore, the Biblioteca Privata (piazza Monte S. Rosalia). 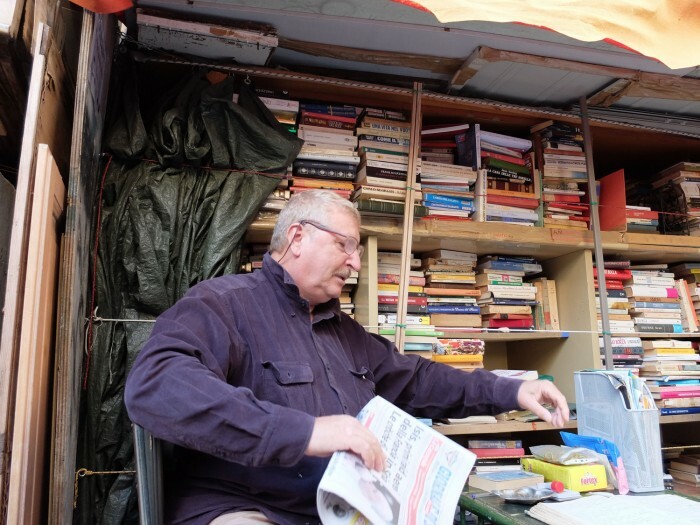 When he retired a few years ago, he put his own core collection of 5000 books into a small shopfront, and started buying up old books, or getting them for free. Soon, his collection spilled out onto the streets. The “stacks” occupy both sides of a narrow pedestrian road, the inside of the shop and another area outside it, and he covers the outdoor bookcases at night with thick plastic. During the day, he sits at a plastic table, his “office”, and talks to anyone who passes by. We met him in the early morning as a group of teenagers passed through. “Hey,” he called out, “if you’re not going to school today, take a book!”. He lends books for free, or you can buy them for a very nominal fee. 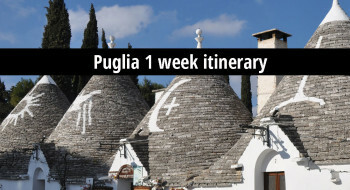 Sicily is a constant food fest and Palermo is one of the top places to eat all day long in Italy! Food knows no boundaries, except that of price, which is way lower than the mainland. It’s easy to go out for a nice dinner for two, with house wine, for €40 – but there are also cheaper options in street food and “trattorie tipiche”. 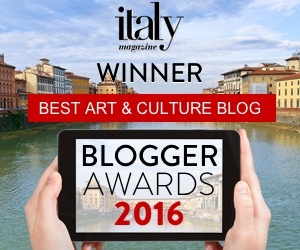 Although food was a driver behind our choosing Palermo as a destination, it’s also perhaps the hardest thing for me to write about – I’m more comfortable telling you about art than about food. I’ve started documenting meals and ingredients on a new Instagram account though, so if you want to see and hear more about this, follow @arttrav_food! These caloric bombs are courtesy of Pasticceria Cappello, considered the best in town. 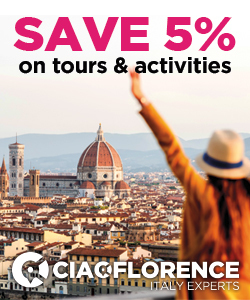 There are two locations, but make the trip to the original one (via Colonna Rotta 68) near the Norman Palace for the full selection. Cannolo, cassata, cookies with almond paste, brioche with gelato (see below) and more – at reasonable prices and with very friendly service. The area is rather sketchy looking, making it all the more fun. 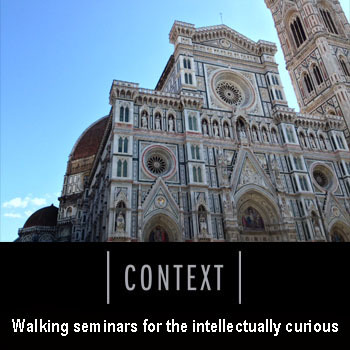 Tommaso made the self-sacrifice of eating gelato for breakfast so we could write this article. The breakfast of champions in Southern Italy is a brioche with gelato, basically a sweetbread sandwich. Purists opt for breakfast-appropriate gelato flavours such as coffee, pistacchio and cream. Unless you’re a marathon runner, this is not something you’ll want to do more than a few times in your life. A major reason for this trip was to eat these fried rice balls that my husband is obsessed with. Called arancini (plural of arancino) up north, here they’re arancine (plural of arancina, feminine). 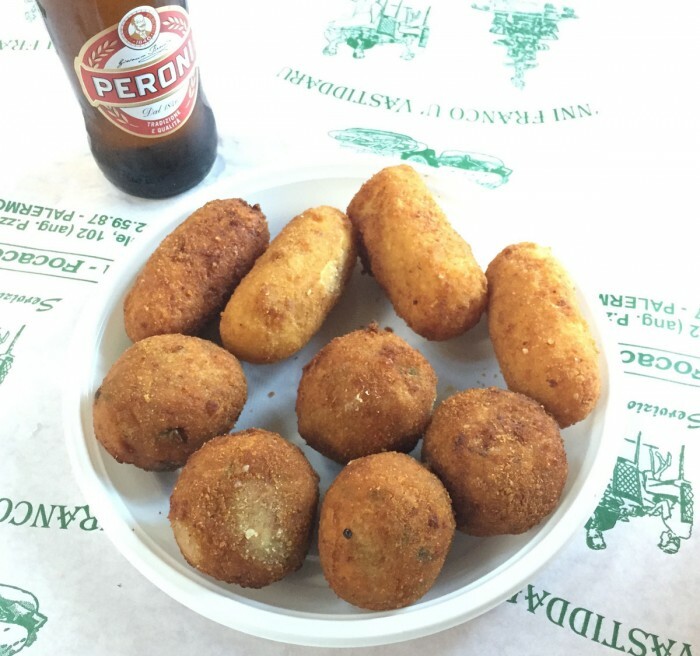 Sicily is the reign of the arancina, which is the street food par excellence. Rice is cooked in broth for flavour and to make it sticky (like a risotto), then formed into balls, cones or sticks, stuffed, mixed or flavoured, breaded and deep fried. Classic flavours are “al sugo” (with red meat sauce) or prosciutto and mozzarella. Vegetarians, check the ingredients, the broth may be meat-based. Although we expected to see arancine on every street corner, this snack was less present than we’d hoped. At Franco u Vastiddaru (via Vittorio Emmanuele 99) you can sit down to have some, but have to order a plate of assorted ones, not just single bites. A chain called Ke Palle also attracted our attention, mainly for the name :) ! We “discovered” pasta fritta at Osteria Mangia e Bevi, a cleaned up, hipster version of a traditional Palermitano restaurant, serving a limited number of seasonal ingredients in relatively rigorously respected recipes. The concept is basically that of pasta warmed up the next day in the pan, though (one hopes) that in the restaurant it’s not old food. The one pictured contains eggplant and cheese, and was baked with crispy bits, served directly in the pan. Lots of fun. Polpette are usually meat balls, but in Palermo they also make polpette di melanzane, eggplant balls! These flavourful fried goodies are served in an abundant bowl of tomato sauce as an appetizer, to be scooped up with a bit of bread. #pasta with #sardines – “pasta con le sarde” as they call it in #Palermo where this traditional dish is served with breadcrumbs, not grated cheese! Pasta with sardines, pine nuts and finocchietto (wild fennel tops), garnished with bread crumbs rather than parmesan cheese, is another local dish with a low-cost history. It’s on just about every menu in Palermo, the city in which it is most commonly found, although this dish is available elsewhere in Sicily as well. Another must-eat in Palermo is another inexpensive street food item called “pani e panelle” or “pane e panelle”, which is a totally un-necessary combination of bread with fried chickpeas. The panelle are made of chickpea flour with water, salt, pepper and most importantly parsley, brought to boil and made dense on the stove. The mixture is then laid out, cut, and deep fried. Good on its own (or with ketchup if you dare! ), traditionally it’s served in something similar to a hamburger bun. So that’s it. 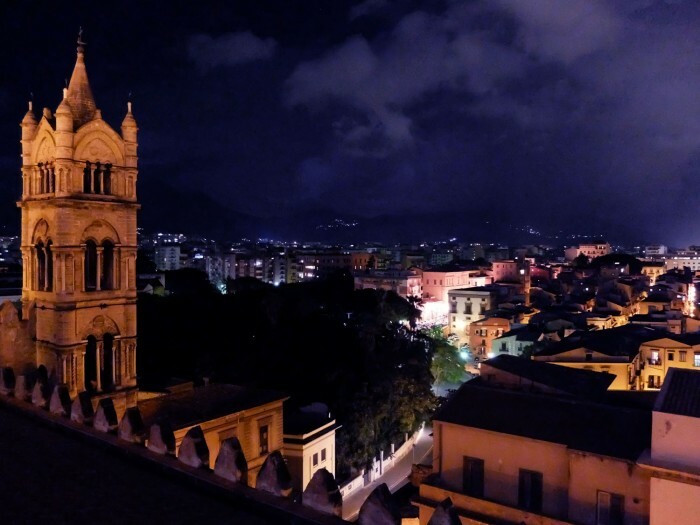 That’s 27 things to do in Palermo – but I’m sure you can find more! We stayed for 4 nights and absolutely recommend the trip.